1. I did gain fifty-seven pounds during my pregnancy and no amount of earnest wishing is going to take them away overnight, though somehow I believed that’s how quickly it would happen. 2. I started out so diligent with counting and tracking my Weight Watchers points daily—a key element to success in the program, in my experience—but have of late allowed for some slacking in this area. 3. Walking to the park, the store, and the farmer’s market from the Bahn station probably doesn’t constitute a proper workout, something I’ve been wanting to believe since I moved to Berlin. Probably the most shocking of all my lapses of reality lately was believing that I don’t look as large as my actual weight—which, if you’ve ever met me or any other woman, you’ll know never to ask me about the specifics of that number. I went to the theatre last week and found myself in the front row. The production included multimedia elements and during several moments, a live camera was focused on the audience. The feed was then played on several TV monitors on the stage, facing outward. When I located myself on the monitors I was horrified to discover that the actual width and roundness of my body was in great contrast to the cute, petite thing I was sure I had admired in the mirror just hours before. I realize the camera adds ten pounds or so, but this was well beyond lens fluffiness. 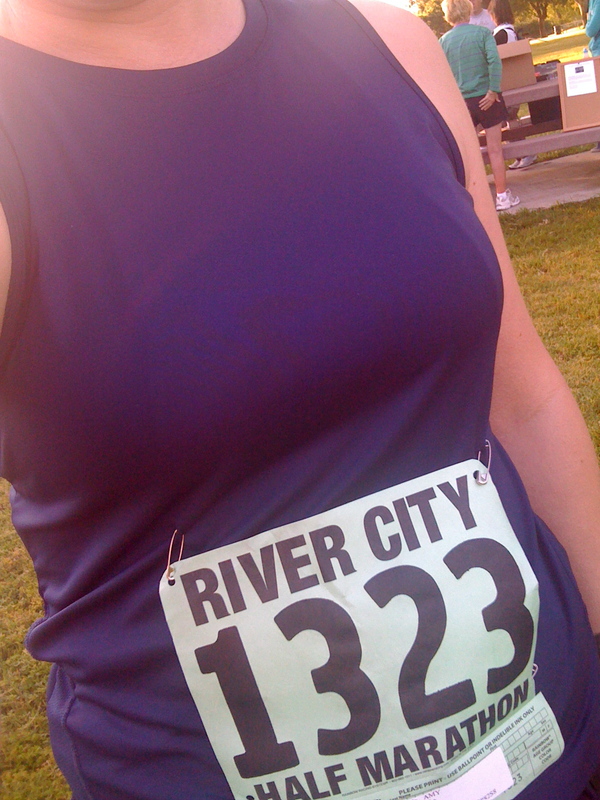 What was particularly unnerving was that I was wearing the outfit I wore when I wanted to look trim and fit. I truly believed that in those garments, no one could tell that I was thirty pounds overweight. What I saw on that monitor, however, told such a dramatically different story that I went into a bit of a sweaty, panic. The camera was still on me (so clever of me to sit in the front row, eh?) and of course I had to continue to smile—my full, ballooning cheeks turning bright red. Thankfully and surprisingly, my stopgap here was to remind myself that I’d given birth a mere six months ago. Yes, some women lose all of their baby weight within the first couple months of breastfeeding, but I’d heard that there was this other lot who only ever lost weight after breastfeeding ceased. I suppose I am in that contingency, and seeing as I’m still breastfeeding, it’s no wonder the weight is still on! For all my kindness, though, I left the theatre feeling small—in self-esteem only. I really miss my pre-pregnancy body. I’d worked really hard in the past few years, pre-pregnancy, to concoct a healthy eating plan that allowed me to maintain my weight. I’d also started running and had gotten into the best shape of my life—something that I really let slide during my pregnancy. In my pre-pregnancy body, I’d always claimed that I was ten pounds away from my ‘ideal’ weight, but truly, I was happy with myself. I miss the clothes that were worn on that body, now tucked away in suitcases under my bed and sullenly hanging in my closet next to dreary maternity-wear. I’m ready to put my ‘full-panel’ stretch jeans away and am saddened by the prospect that I’m not even close to doing so. It all makes me want to eat some chocolate. But of course, I cannot. Well, I can, actually, just not the self-medicating portion I would prefer. Where to go from here: Let me assure you that I’ve been here before—on a diet, trying to lose weight—many a time. Perseverance is the only solution. This week, I’m attempting count and record every point of food I eat. As far as exercise is concerned, I’m using the start of spring to begin running again (by the way—it’s not spring yet, no matter what the temperatures say—spring starts when we get back from vacation mid-April, thank you very much!) Tonight I had just two pieces of dark chocolate instead of four, the self-medication equivalent of a Flintstone vitamin. My husband is the biggest supporter of my efforts in every single way imaginable. He often makes dinner and weighs all of our food on the kitchen scale so I can calculate the points. Without even asking him, he portions out things like butter and oil in his cooking so it’s easier for me to keep track of what we’re eating. Probably the most valuable thing he does is let me know that there is someone that thinks I’m beautiful even if I have my serious doubts. He’s militant, in fact, about not letting me bemoan my proportions. 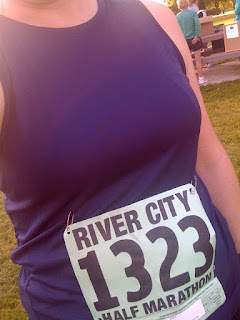 Photo: Me, River City Half Marathon, Sacramento, California, 2010, Pre-pregnancy. Love him. And love you, because the on/off weight watchers is my current plan of attack as well. Also, I'm about 25 lbs from my ideal weight, but I think I wear it well. Let's wear it well together.